Picture of Trojan Cooling Tower across Columbia River, 1992. I am not "knee jerk" against nuclear power. It is not likely to be the monster some fear. Nuclear energy may make a comeback in this age of worry about greenhouse gas from fossil fuels. Europe gets much of its electricity from nuclear. It may be easier to give nuclear a comeback than getting people to radically change their energy consumption habits. In an age of greenhouse worry, electric cars, powered from nuclear energy, may be common; unless people are willing to give up cars. I have never driven, but I fear others are not like me. It would be better if we could utilize hydrogen fusion, rather than uranium fission. Solar and wind would be better also, but nuclear is likely to make a comeback for a while at least. Remember the Earth has a limited supply of uranium. Nuclear fission may not be a monster, but it's not a panacea either. Put mouse cursor over image, then pull it away to edge of page. See what some people fear. 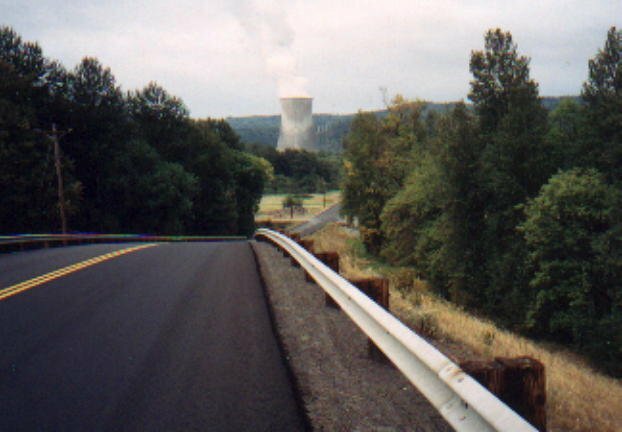 Cooling tower in distance at Trojan Nuclear Power plant near Portland, Oregon. Picture taken in 1992. Since then that plant has been decommissioned. It's demise was partially due to a warranty dispute between a manufacturer and the utility that operated Trojan. When cracks are found, who should pay for repairs? What does that fine print say? Now torn down. This image taken in 2005. Along Oregon Highway 30, just north of Portland is Trojan Park. Once was the Trojan nuclear power plant. The power plant is no longer in use, but it's original buffer lands make for a park. Can people be trusted with nuclear power? A group of anti nuclear protesters made international headlines when they bombed a power plant near Baghdad, Iraq. Unlike most unshaven protesters, these were Israeli military pilots who feared a possible link between nuclear power and nuclear weapons. The US Reagan administration has suspended sale of F-16 bombers to Israel. Reagan has long been a staunch supporter of atomic energy. It is his contention that nuclear power is safe. According to US officials, Israel was acting out of a sense of irresponsible panic. Israeli officials have stood by their conviction that a nuke in their backyard is unsafe; especially in the hands of Iraqi president Saddam Hussien. He is said to have reassured the Iranians that any nuclear bombs made in his country would be directed toward the "common zionist enemy." Israel may have had good reason to fear that reactor in it's back yard, but some say she is a bit hypocritical. It is believed that Israel is also making atomic weapons at a reactor in the Negev Desert. This piece got my publication mentioned in a book about obscure newsletters. That book is titled, "Cats, Chocolate, Clowns, and other amusing, interesting and useful subjects covered by newsletters." Edited by Greg Mitchell. Published by Dembner Books. Today we fear nuclear power in the hands of the Iranians. On the other hand, Europe and Japan get much of their energy from nuclear.